Gas prices are around 50 cents higher this June than they were last year and that is having an impact on demand. The drop in demand is only one of the factors that has led to a slight decrease in gas prices this week. “Contributing to the downturn in prices is crude oil costs, which have dropped nearly six dollars a barrel just in the last few weeks,” according to White. She says gas prices will usually drop from two to four cents a gallon with each one dollar drop in the price of oil. But gas prices here haven’t dropped down to their levels seen last year. 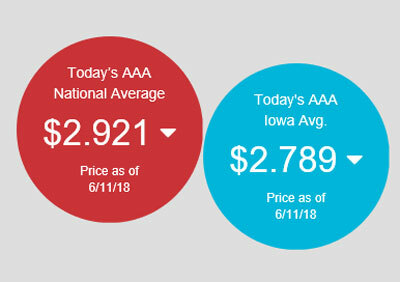 White says gas is averaging $2.79 a gallon in Iowa or about 13 cents below the national average. That price is a drop of three cents from last week — but the cost is still 53 cents higher than one year ago when a gallon of gas cost $2.26. Summer driving often leads to an increase in driving and an increase in demand for gasoline. But White says drivers are making adjustments with the high fuel costs. “It seems that when prices do rise people shop around. And the also may even change their driving habits,” White explains. “When we start to see big spikes in prices, those with flex-fuel vehicles may favor the E-85 blend.” The E-85 blend is cheaper than the other blends of gas. South Carolina is the state with the cheapest gas — coming in at $2.58 a gallon. California has the highest average price at $3.17 a gallon.